During the twenty-four years Dan Rather worked as the anchor of the CBS Evening News, the role of the anchors, as well as the discourse about and expectation of the anchors, changed dramatically. Their functions broadened as they became the faces of the networks, helping secure viewership in times of heightened competition. They also turned into cultural icons and celebrities, becoming news themselves and blurring the lines between news and entertainment. While television news anchors were never just readers of news, the arrival of Walter Cronkite in 1962 set new standards for the position of anchor. He brought with him extensive experience as a print and radio correspondent and insisted on the title of managing editor, giving him more control over editorial decisions. Television news, which expanded from fifteen to thirty minutes that fall, achieved in 1963 a new legitimacy as a reliable and trusted source of news after the coverage of the assassination and the funeral of President Kennedy. As the face of the networks, when close to 50 percent of Americans watched the evening news on the three networks combined, the anchors and their roles came under scrutiny, as shown in a reading of the following newspaper articles. In 1978, Fred Ferretti in the New York Times asked “When They ‘Anchor’ the TV News, What Do They Do ?” He concluded that the anchors he looked at, from Cronkite to John Chancellor and Barbara Walters, were “essentially more important as personalities that they are as professed news gatherers. They are news.” Laying out the process by which the evening news is put together, Ferretti concluded that, theoretically, anyone with television training could be the anchor, “even though the anchor people prefer to be thought of as news people, as reporters.” Ferretti noted that although most anchors emphasized their solid journalistic background, anchoring the evening news is more about "presentation than substance" and that in the end, anchors are actors. A decade later, after Dan Rather was chosen to be Cronkite's successor, Edwin Diamond explored the role of the anchor in the New York Times in "Television's 'Great' Anchors—And What Made Them Rate.” He looked at some overall patterns in the selection of anchors, noting that most are middle-aged, mid-American, white males. Diamond listed several characteristics of a good anchor: one that writes and reports well; has broad experience, at home and abroad, covering politics and wars; is neither too young (which would be interpreted as lack of experience) nor too old; must have “certain cosmetic advantages: voice, presence, good looks, but not too good-looking"; is able to project, like any good performer; should be a company loyalist and a team player. In addition, he embodies the “serious yet not too-intrusive authoritative model” that developed in the 1960s. Numerous articles criticized the very system and status of the anchormen, including the glaring absence of female anchors. They also predicted the end of the evening news as people knew it, with one major anchor, and foresaw a model with multiple anchors as done by CNN. Another worry was that too few young people were getting the "rigorous training as reporters that creates an authoritative television journalist," especially in terms of their responsibilities as reporters and in the quality of their reporting and writing skills. While the multiplication of cable news channels and the revolution brought about by the internet, network news is struggling to find a role in the media landscape and retain, as of 2017, the model of the sole anchor. They also stay in the tradition of Cronkite and Rather by emphasizing the experience and skills of their anchors. Advertisements for current anchors, such as David Muir on ABC News in 2015, showcase him in Syria, Cuba, Gaza, and Ukraine, and resemble the same types of ads for Dan Rather in the 1980s. 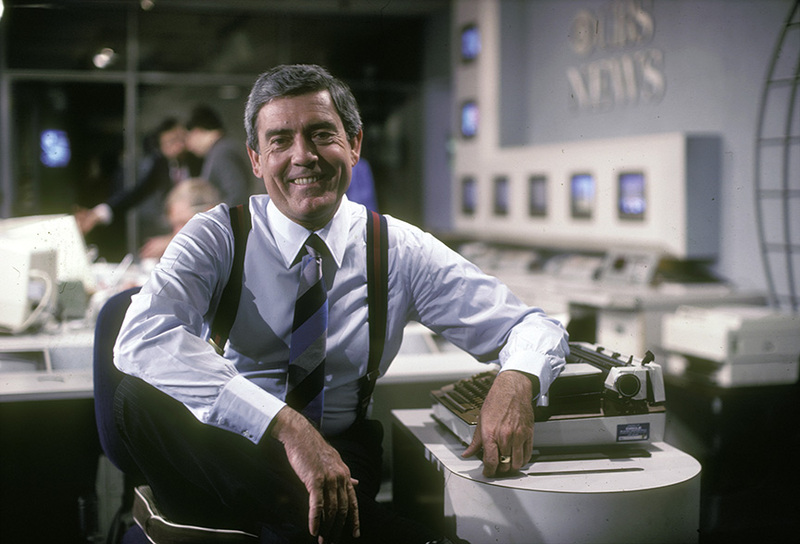 Despite all this focus on him as both a journalist and a celebrity, Dan Rather for his part has consistently stated that, professionally, he wanted to be seen as a “reporter with a capital R.” After leaving the anchor chair in 2005, he went back to working as a reporter for 60 Minutes. After leaving CBS, he started his own investigative news magazine, Dan Rather Reports, where he did more than 250 stories.